Werewolves. And a rich, hot Alpha – sounds good doesn’t it? So book request went in and I became immersed in Drake and Emelia and their love story. Drake is CEO for the company that Emelia thinks has wrongly bought the property her bar stands on and she’s determined to see him, despite her letters and emails being ignored. She gets a temp job as secretary there and is ducking out of a staff party, sneaking good wine from the boss’s cellars when she meets a drop dead gorgeous man….and Drake discovers this human is his Illuminary – soul-mate basically, the one person that is the perfect match for him and his wolf. He’s surprised she’s a human as he was expecting it to be another wolf, and as he’d given up hope 200 years ago of ever finding her he proceeds cautiously wanting to check and double check. Then Emelia is attacked and he realised someone knows about her and that places her in danger. 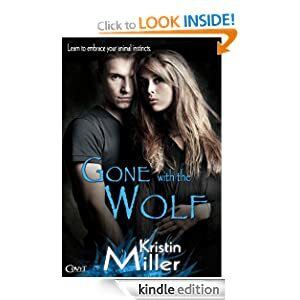 I enjoyed this book, a sweet romance but the werewolf twist adds a bit extra to the usual and makes it more interesting. The human turned werewolf and children conundrum also added that bit extra. I love a paranormal twist to a book so this was perfect for me. Drake was a great Alpha – strong, commanding and decisive, and yet caring in that he knew the whole werewolf mate thing needed to be handled carefully and it would come as a shock to Emelia. He needed to sort the bar problem out first too – trying to talk to her about love when she was angry over that wouldn’t be a good start. I’d have liked to have seen a bit more of the Pack, the only werewolf interaction was slight, and only where it fitted into their romance and the danger she was in, and being a sucker for the paranormal I’d have liked to see more of the workings and daily life of the Pack. We didn’t really see how Drake meshed that with his job as CEO which was disappointing. Emelia was a good female lead, strong and independent. I hate the simpering females that are often the romantic lead and Emelia had a mind of her own. As future female Alpha she’s need that, so it was a realistic piece of writing. The characters were well described and felt real, and each played their own part in the story. We didn’t see much of Drakes twin and rival, and I couldn’t help wondering how they’d gone so long as rivals but only come to a head when Emelia was found. I know she was key to the Pack Alpha position, but it seemed that the rivalry had been going on far longer and I’d liked to have known a bit more about it. Its a well written and edited book, and priced at £2.16 for 455Kb its good value – from time taken to read I’d guess at 150-200 pages. I enjoyed it as a one off read, but not in-depth enough to join my keepers file. Its a great book if you want something light to read, or to fill a train journey or something. I like to get “into” a book and this was a bit too light for me but I know other readers want something light that they can pick up and put down as time allows without having to retrace back on the story and for that this is perfect.